This is GREAT! The grill side is perfect for either grilling, or a griddle. The one eye is a little underpowered at 5,000 BTU, but that only means it takes a few more minutes to boil water, or perk my coffee. The oven works wonderfully, and the smell of cinnamon buns this last weekend was unbelievable! As was the peach cobbler! A whole new world of camp cooking just opened up to me. I love it. My wife has always said, "why did you bring that (grill, stove), just cook over the fire!" But when she saw the camp oven, she immediately said, "that's a keeper". The OTHER thing I did this weekend, was to solve one of my big complaints in camping.....The grill/stove is never level!!!!!!! And when cooking bacon/eggs, everything always runs to one side of the pan/griddle!!!! Frustrating...because the campsites are not level! I was tired of trying to level with little pieces of wood, rocks, etc. So, I started with a scrap piece of 3/4' plywood, and painted it to withstand some elements. Then I placed 3/8" T-nuts into holes drilled in the corners, and placed 3/8" carriage bolts through from the bottom. On the top side I used T-handles screwed on, then held in place by a 3/8" nut (so I can raise and lower the bolt's using the T-handle). I then placed some small restraints to keep the table from slipping, and then placed a double/bubble level in the center. So, you raise or lower the corner posts, using the T-handle until your platform is level, place your table (mine is an Aluminum camp table from WalMart), and mount your grill. If your stove/grill is a little lopsided, place a level on IT...and readjust the legs until the top is level. It works great! Here's a picture of the table mounted on the leveler board. I started (these pictures) with 4 1/2" carriage bolts, but the ground isn't usually THAT unlevel. So, I have changed them to 3" and I'm sure it will work better. really interesting....I have seen those camp even units and I like the griddle. Funny though since we got the Escape--I do all my cooking indoors...Use the toaster oven when we have services and I have the coleman one to use over a campstove....is this powered by thsoe 1 lb units or a bigger tank We have a 5 or 8 pound tank.. It will work off of either. The smaller bottle attaches directly to the rear of the stove, or an extension hose (came with it) attaches it to the larger tanks. Here&#39;s the link, where there are a couple of neat videos. The stove is on sale for $199 Should last for years. I have looked at the Camp Chef oven here at Bass Pro. It is about $200 there too. It looks like a great unit, my only concern was the size and weight of it, and where I would store it. The nice thing about this is it takes the baking outdoors instead of in the trailer. We had an oven in our last trailer, and in 500 nights of sleeping in it only used it maybe 6 times. In hindsight we should have used it more. 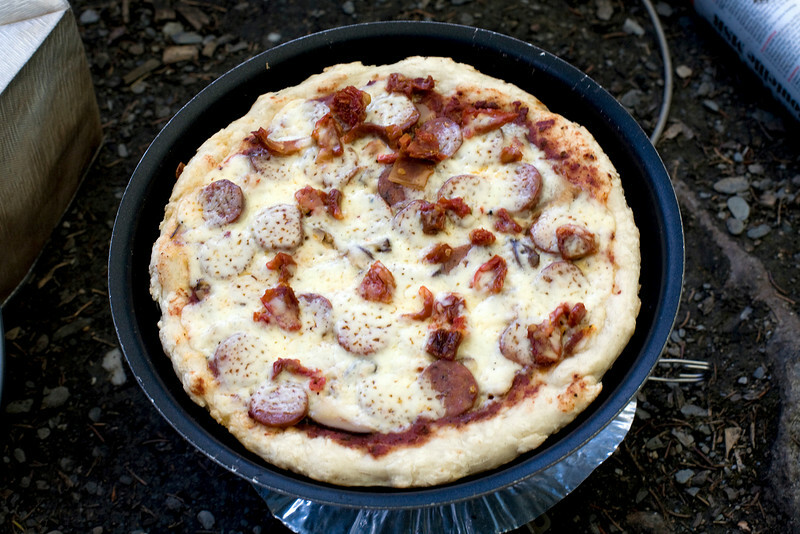 What I do take is my Outback Oven which is a lightweight backpacker oven that works great. I think I only used it three times in the last two years of owning my Escape, once for making a risen dough pizza, and twice to make cakes. While canoeing I have made tons of stuff in it, including many a scratch cake, focaccia bread, pizza, cinnamon buns and the like. Nice leveling pad you built. I know too well how hard it is to find a level spot. Pancakes too are a real pain when off level. You have me thinking now, what about building some simple removable leveling feet for the table? I have never had an oven, but I'm sure gonna use it now! It was so much fun smelling those cinnamon buns cooking : - ) And hot fruit cobblers!!! Nice thing here, is that you can use it on or off grid, as opposed to a toaster oven design. 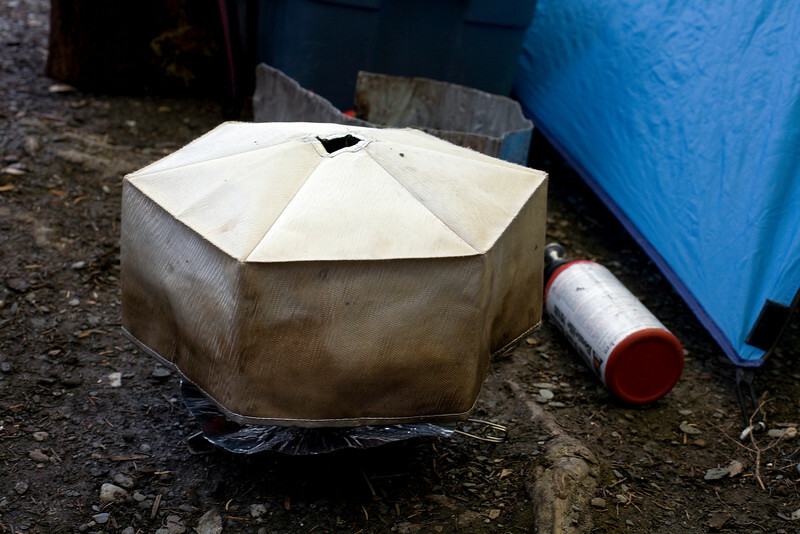 I've seen those campfire ovens you have, and they are really cool. Collapsible if I remember. We got a padded bag for the oven, so it's the last thing into the camper, and first thing out. Really not that heavy. I had thought and thought about how to level my stoves, usually ending up sliding whatever under the feet, and feeling uncomfortable with the stability. My last stove had legs that slid out a little, but that was difficult to get level...lots of trial and error, and more than an inch out on any leg made it unstable. I was constantly thinking how I could use "leveling feet" on the table. I was musing about it to my wife, and she said "why don't you just put a piece of plywood under it? ", as if just a piece of plywood would level out the ground. But then it hit me, instead of leveling out the stove, yes, level out the ground!!!!!!! This solution allows you to hover over the "leveler", eye on the bubble levels, and simple turn the handles to level. Could have used a tripod design too. If I find lots of soft dirt/sand to where the heads of the bolts sink in too much, I can easily add small wood "pads" to the feet. So far, so good! Happy Thanksgiving to you to Dan. Isn&#39;t life just full of stuff to be thankful for? You are referring to a reflector oven, and I have seen them in use and they work great. Mine is a little more portable and uses a stove for heat. I do see how that plywood base would stabalize the table good, better than just leg extensions. What about using a lightweight aluminum frame, maybe one that could fold down. for storage? Here are a couple pics of pizza being made on my Outback Oven. I may have shared them before, I forget.